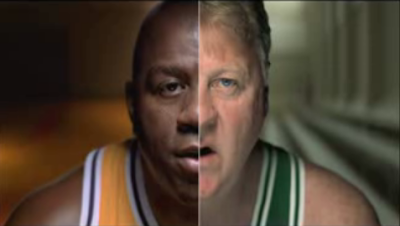 Does anyone else think the half-and-half "There Can Only Be One" Commercial with Magic and Bird looks like a stroke victim talking? Furthermore, isn't it kind of weird to see both guys are wearing jerseys? One is a successful businessman in the LA area, the other is now an executive for the Pacers...and they're wearing jerseys like a 15 year-old fan. Odd. I actually like this ad campaign because its focus is developing the personalities- something the league did very well in the 80s and 90s. That said, the NBA still stinks.